It's not every day you see a child's room overtaken by enemy armies, but that's what toy soldiers are for. In Melsoft's strategy/tower defense game Toy Defense 2, you'll place various units around different battlefields, waging war with both ground and air assaults while upgrading your forces to deal with even more dangerous enemy waves to come. It's a freemium game, so if you want to get the most from it, you may need to spend a few bucks. To help you get started, we put together this helpful tip guide to squash the opposition. -Location, location and location. With Toy Defense 2, you only have a certain amount of space where you can set up defenses, like soldiers and interceptor planes. Make sure you put them in pivotal spots to thwart incoming forces early. You'll see the highlighted route where enemies will appear, so place a couple of units as close to the entryway as you can, then a couple more close to the base that you're defending. Once you have extra resources, add some more to the center of the route. -As you get through the game, you'll have the opportunity to invest in power-ups. They are divided into four categories - Riflemen for your ground troops, Interceptors for aerial units, Artillery for general unit firing and Ack-Ack for turret cannons. Each one has that killer advantage that makes it that much better on the battlefield. 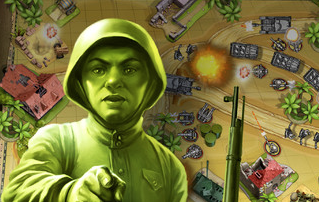 -Riflemen are especially useful, as they can fire more powerful shots than normal soldiers. Invest in these power-ups, because you only have so many stars to spend before the next round starts. -Death From Above is a huge advantage for Interceptors. They'll take damage over time, and activating this feature turns them into kamikaze bombers. They'll crash into the nearest enemies and create a massive amount of damage that will take several units with them. You'll suffer their loss, but gain the advantage over enemy numbers. 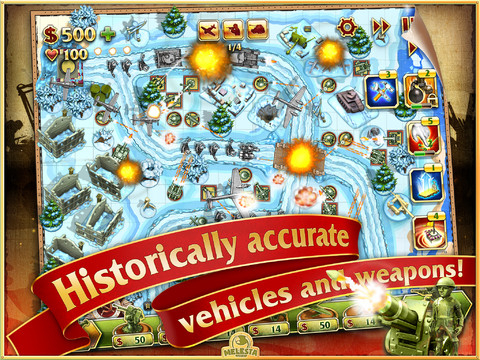 -With Artillery, make sure you invest in multi-rocket and Katyusha rocket launchers. They deal a whopping amount of damage, particularly to tanks on the ground and warships flying overhead. Rocket launchers carry more ammo, but Katyusha shots are more powerful. Invest in both. -When investing in Ack-Ack power-ups, go for HE ammunition and Iron Kaput. With the ammunition, your projectiles will explode in mid-air, dealing out mega-damage and causing vehicles to crash. The Iron Kaput lets you turn enemies against one another, as planes will come crashing down into their allies. Even though they're expensive - ranging from 210 to 325 stars at first - these power-ups are worth it. -Finally, don't forget to take advantage of your Arsenal. Here you'll find a number of power-ups you can use for your entire team. Maintenance Personnel lets you repair damaged fire nests with ease over two waves, while Hand of God will crush all enemy forces with one swift stroke. You'll need coins to buy them, which you can either purchase separately or earn in game. Good luck.